Dog Jack belonged to an 1860's Boylston farm family and their twelve-year-old son. Dog Jack's young master took his father's revolver and went to the pasture to hunt or target practice. No one knows for sure. When things go wrong, they sometimes go very wrong. The young lad tripped and fell, accidently shooting himself. Dog Jack sniffed at the lad, and, getting no response, ran home for help. Jack barked and raised a commotion. He even tugged on the pant leg of the boy's father. Finally, the man acknowledged the dog and raced after Jack. Dog Jack led him to the wounded boy. The father found his son fatally wounded and carried the boy home where he later died. As was custom in those days, the boy was buried on the farm property in the family plot. Time went by and Dog Jack grew old and died. He was buried at the feet of his young master. Some time went by and the boy was disinterred and reburied in the town cemetery. Jack was left buried on the farm. End of story? No. 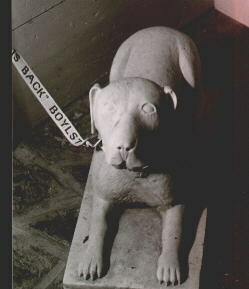 A likeness of Dog Jack was made and placed at the foot of the boy's grave where it remained until the 1970's when it was stolen. Dog Jack's statue had been missing for years when a Boylston police officer on patrol noticed something on a stonewall covered with brush. Jack was found! He was given to the Boylston Historical Society and made the Society's mascot. Dog Jack is featured on a coffee mug, children's coloring books, and holiday greeting cards sold by the Society. Jack can be seen in the foyer of the Society's headquarters where he greets visitors and members alike. His mouth open and his tail wagging - well, almost wagging.